An extra post this week as I have got a new addition to the blog. Some time ago I read on Thimbleanna’s blog about a photo scavenger hunt for each month organised by Kathy – each month she puts a list of things that you have to go and take pics of and post them on your blog and there is a Flickr group as well but not done that yet. As I love taking pics I though it would be fun to do and it was, there were some that were a bit of a challenge and I had to be quite creative with. I kept my camera in my bag while I was out and about on my visits – quite a few of these are from a day out in Leeds. 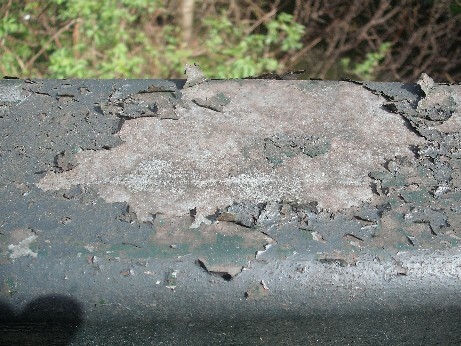 I have just gone and looked at the list for April on Kathy’s blog and am very excited as there is something that fits in exactly with our recent field trip! Thimbleanna’s pics for March can be found here and mine are below. This picture was taken on my way home from work – my building is next to a canal and this is from the bridge over it. I had to think hard about this one as no zoos near us! 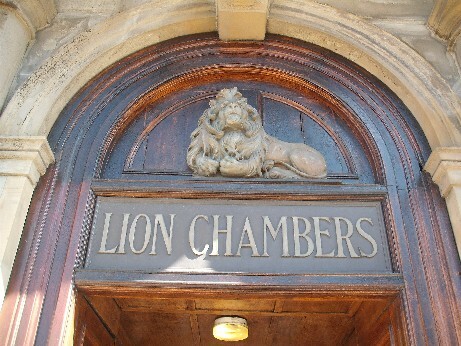 But very near the train station where I spend lots of my time is a building called Lion Chambers built in 1853 and they have not one but two lions – one on the roof…. … and one over the door. 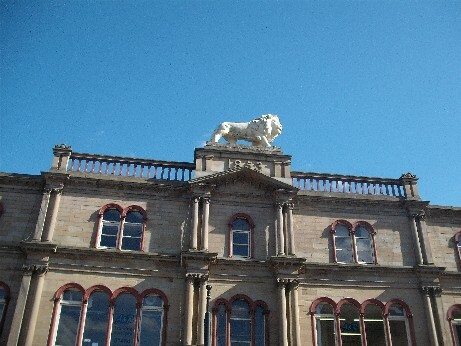 Apparently the one on the roof is not the original stone one but a plastic replica – have not been near enough to check! Of course living in Yorkshire there are loads in the fields but could not get out to the country for a good photo but found this cute little choc one! This was a challenge as well – lots of rain here but no bows, until we went to visit my sister and I spotted this logo on one of her Facebook pages.Sorry it is so fuzzy! 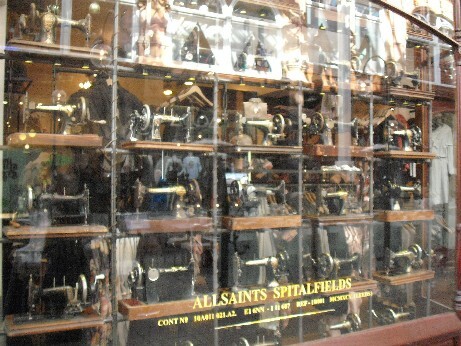 I had spotted this the week before in Leeds, this fantastic collection of old sewing machines is the front window display in a clothes shop in one of the beautiful arcades, they are a chain and one of my friends mentioned she had seen the same display in their branch in Manchester so they must have hundreds of them. They are so lovely. Here is a close up so that you can see them better. 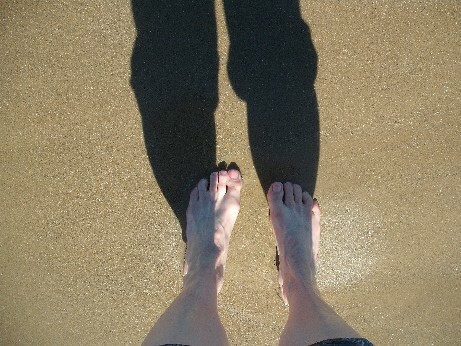 I was going to use this one for another category but here is a pic of my feet paddling in the sea on my recent visit to Spain! 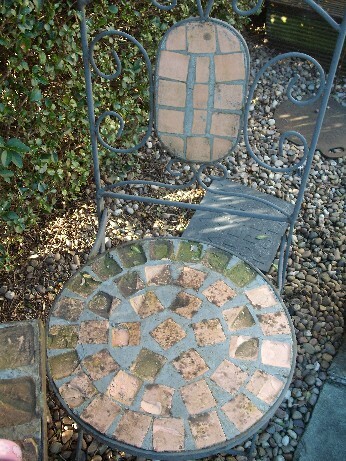 This is one of a pair in my garden – we don’t use them to sit on any more but I love the way that the terracotta has weathered. This belonged to my Nana who now lives in Spain. 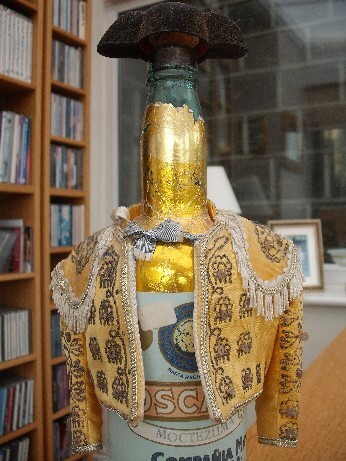 She bought it when she first visited Spain in the 1960s and it is a little matador jacket and hat for a bottle (every home should have one of course!). It used to live in her lounge which she referred to as ‘the room’ which we only ever went in on special occasions like Christmas. She used to make corned beef and onion sandwiches on white bread which I thought were delicious and trifle and coffee with all milk as a special treat. 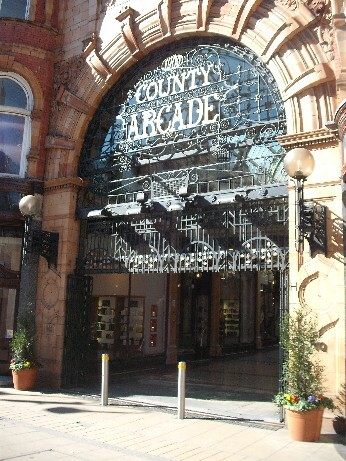 This was taken in Leeds again and is at the entrance to one of the Victorian arcades with all the very posh shops in! The actual gates are folded back at the sides. 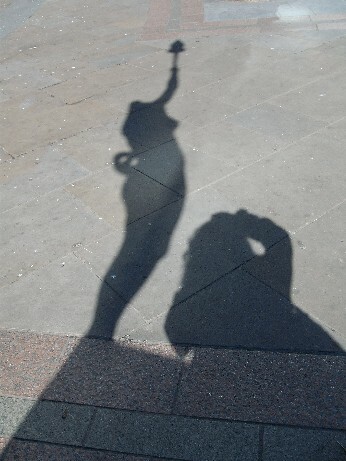 I could have used the one of my feet above but I decided to try some arty shots so this is me taking a pic of one of the statues outside the train station in Leeds. 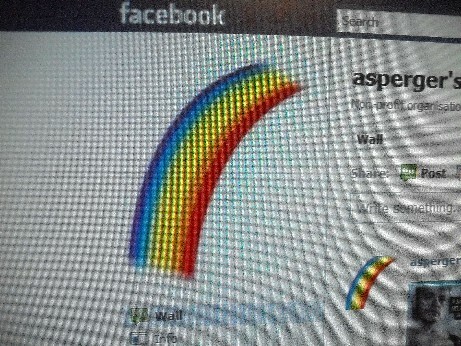 I wanted to interpret this rather than take a picture of a ring. 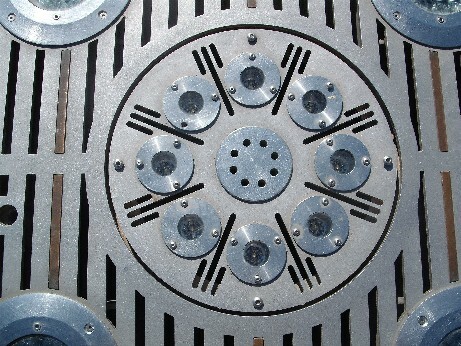 This is part of a water feature outside our train station (again) – as well as water there are lights that change colour. 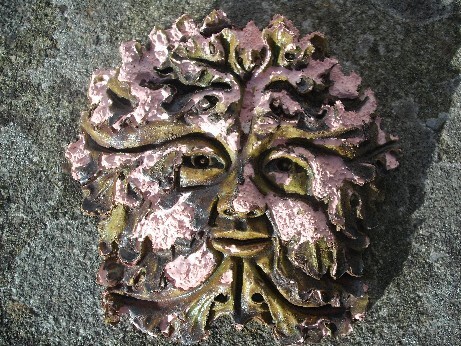 Again from my garden, I have several of these terracotta representations of a pagan figure – the ‘Green Man’ – they gradually degrade and get covered in moss. I have really enjoyed finding all these pics and hope that you have enjoyed looking at them. Have got the new list for April so will be off snapping again! Made with love – and surprisingly straight machine stitching! Great pictures! They’re all so clever. 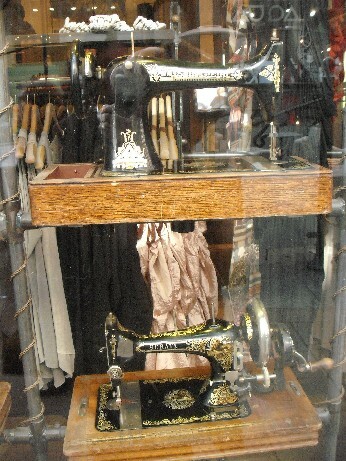 It was interesting to read about the store with the sewing machines. As I started to read your description, I was thinking “but, I think someone mentioned seeing this shop in Glasgow” — thanks for explaining how that could have happened. Thanks for the shout out. 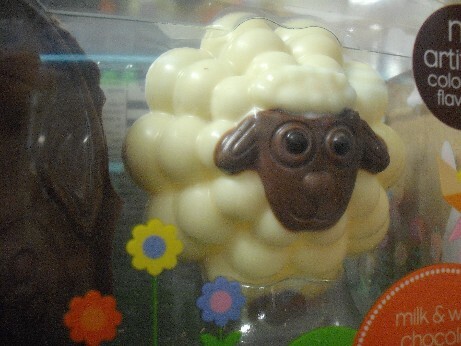 And now, that little lambie is telling me to go find some chocolate! Yes I must look up the company see how many stores they have – there must have been 50 machines at least as they had two large windows – at least the machines are there to be admired rather than being scrapped. Thanks for visiting again.